인왕반야경은 우리나라 호국불교의 근본 경전으로 신라와 고구려에서는 이 불경에 따라 호국정신을 길렀다고 한다. 주인왕호국반야경은 인왕반야경을 송나라 정원(淨源)이 해석한 것이며, 이 책은 목판에 새겨 닥종이로 찍어낸 4권 1책으로 크기는 세로 29.7㎝, 가로 18.8㎝이다. 대각국사 의천이 쓴 기록을 보면 이 책 끝에 과문(科文:단락을 나누어 경전을 해설하여 이해를 돕기 위한 글) 1권이 붙어 있었다고 하는데 여기에는 그 과문이 빠져있다. 간행기록이 없으나 일본에 있는『대방광불화엄경수초연의초』와『정원신역화엄경소』등의 속장경과 판의 형식, 글자의 새김, 글자체가 비슷하여 11세기 초 의천이 만든 속장경으로 추정된다. 목판의 새김이 우수하고 인쇄가 정교하나, 경문 곳곳에 보수한 흔적이 있어서 원판을 보완한 뒤에 다시 찍어낸 것으로 보인다. 우리나라에서 거의 전래되지 않는 속장경 판본이란 점에서 그 가치가 크다. Inwang banyagyeong (Humane King Sutra) is the basic scripture of the state-protected Buddhism in Korea. The people of Silla and Goryeo are said to have raised the spirit of defending their fatherlands with this scripture. 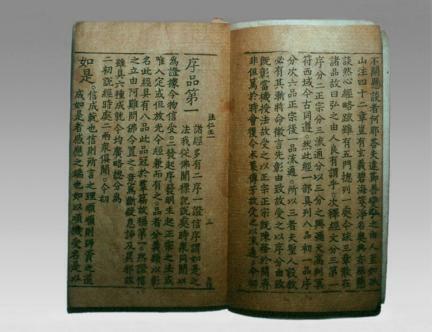 Juinwang hoguk banyagyeong was the interpretation of the Humane King Sutra done by Jingyuan of the Song Dynasty of China. This book, printed on mulberry paper with woodblocks, consists of one book with four volumes and measures 29.7cm long and 18.8cm wide. According to a record written by State Preceptor Uicheon, one more volume was attached to the last part to explain each paragraph of the scripture and aid in people’s understanding, but it is now missing. 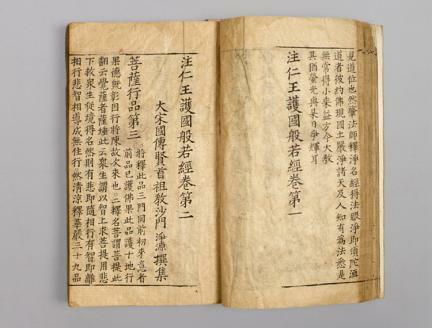 Though there is no record of its publication, this book is assumed to be part of the Supplement to the Tripitaka Koreana produced by Uicheon in the early 11th century. 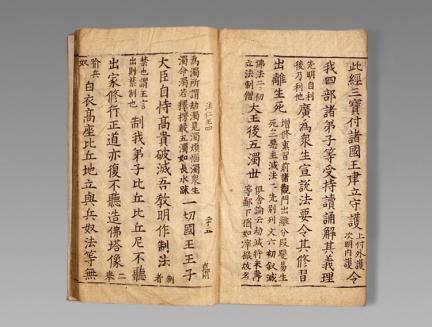 It shows similarities to some remaining sutras from the Supplement to the Tripitaka Koreana in Japan in terms of the formation of woodblocks, inscription style, and font of the characters. In spite of the delicate inscription of the block, it seems to have been reprinted with the supplement of the original, since there are some traces of repair work. 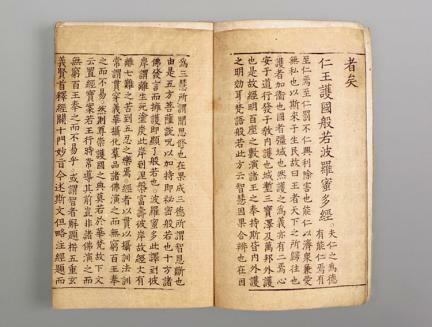 This book is highly valuable as one of the Supplements to the Tripitaka Koreana, which is rarely handed down in Korea.